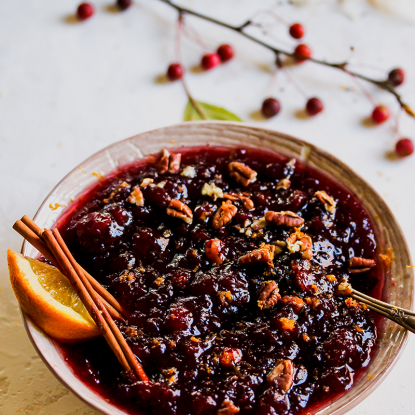 In need of a simple fall side dish that’s easy enough for a weeknight dinner yet elegant enough for your family’s holiday gathering? 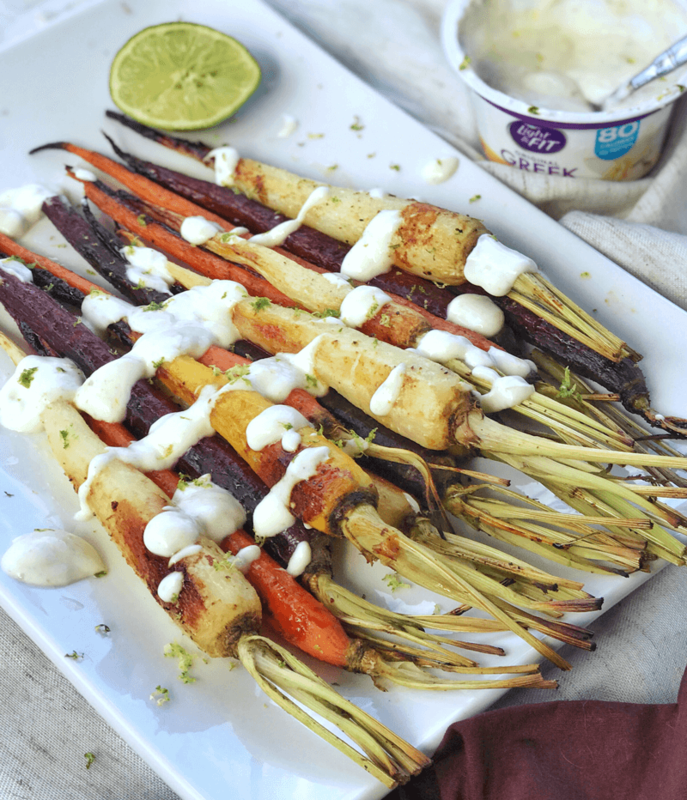 These Honey Roasted Carrots with Cumin-Lime Yogurt Sauce are just the recipe! This post was created in partnership with Dannon Light & Fit. I have been compensated for my time commitment. However, my opinions are entirely my own and I have not been paid to publish positive comments. Because roasting is one of the easiest and most flavorful ways to cook veggies, I decided to stick with my tried-and-true method but sub-in and jazz up some other types of vegetables. Carrots are a veggie that rarely garner complaints from my family so I found some bunches of long, multicolor carrots to create this fun recipe. Since dinner prep is always tight, I like a superfast marinade that works double time. 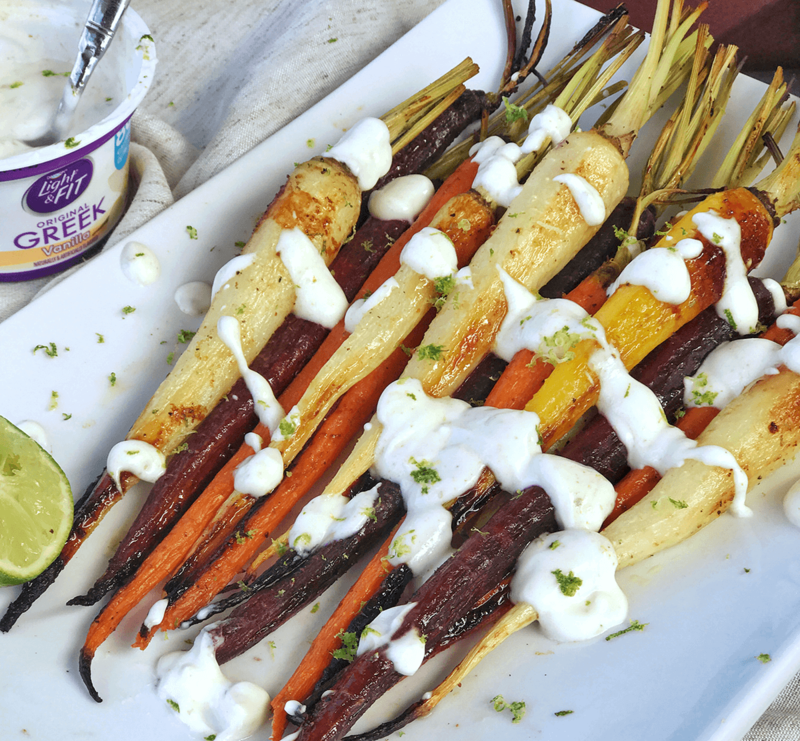 This one flavors the carrots before roasting and flavors the yogurt sauce for drizzling. The combination of honey, olive oil, lime juice, lime zest and cumin enhance the sweetness of the carrots while giving it another, deeper layer of flavor. When I add the marinade to the yogurt sauce, it sweetens it up while also mellowing the flavor making the sauce an ideal accompaniment. To make the sauce, I start with Dannon Light & Fit Original Greek Yogurt. You can use plain or have some fun with a flavor like vanilla. Light & Fit offers a variety of products that fit your flavor preference and lifestyle. Next, simply stir in the cumin-lime marinade. 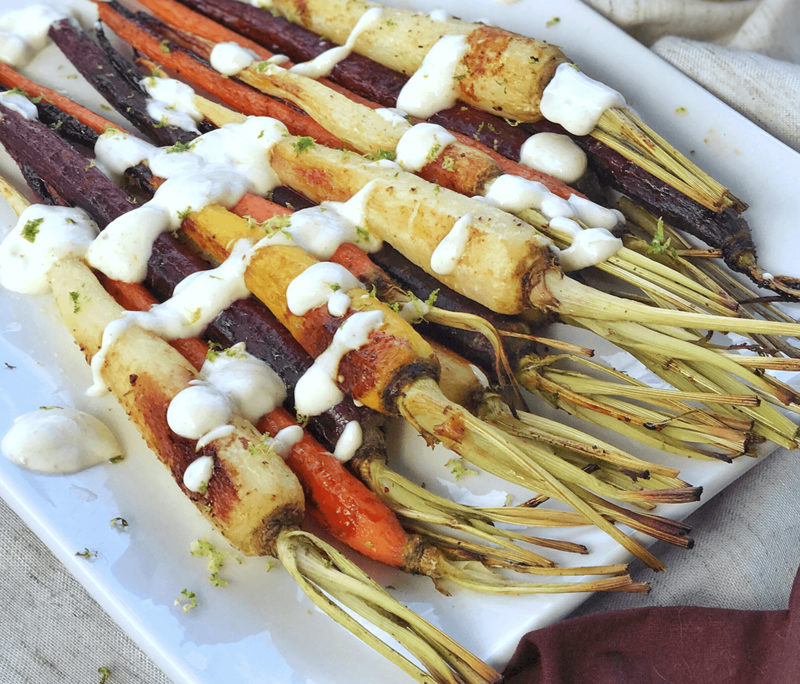 The flavor of the marinade gives the sauce a zesty zip that pairs perfectly with the carrots. Adding yogurt to your daily routine is an easy and important way to help create a balanced diet and healthier lifestyle. Of course, you can eat it straight from the cup for a delicious breakfast addition or snack but I also like incorporating it into recipes as part of a dip, sauce, or cooking/baking ingredient. If using carrots with fronds (long green stems), trim to 2-3 inches from stem before roasting. Don’t throw away the fronds! Wash, chop and sprinkle over the cooked carrots for a pretty presentation. Another idea for the carrots greens, use them as part of a pesto or salsa verde like in this Carrot Top Pesto from Epicurious. The flavor is bright and taste is somewhat like parsley. 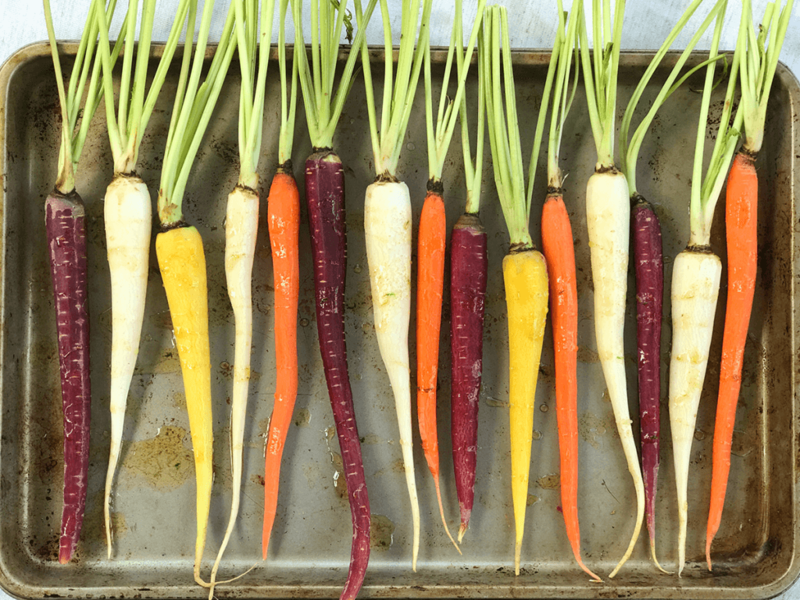 Choose multicolor carrots for a fun presentation. Cut carrots in half lengthwise if they’re thick for even cooking. 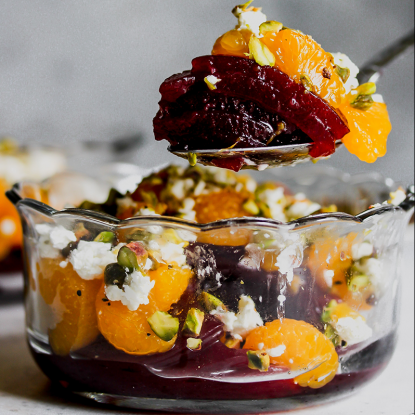 On the hunt for a superfast sweet and savory side dish? 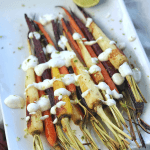 Honey Roasted Carrots with Cumin-Lime Yogurt Sauce is the recipe for you to make dinnertime colorful and fun! 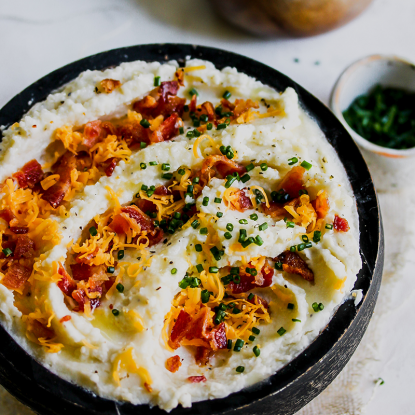 What is your favorite side dish to serve during the fall? In a small bowl, stir together honey, olive oil, lime juice, lime zest, and cumin until combined. Arrange carrots on a foil-lined baking sheet. Drizzle the carrots with half of the honey mixture reserving the other half for later use. Toss carrots in the honey mixture until completely coated. Bake carrots for 20 minutes or until tender and caramelized; turning once halfway through cooking. While carrots roast, add remaining honey mixture to yogurt and stir until combined. 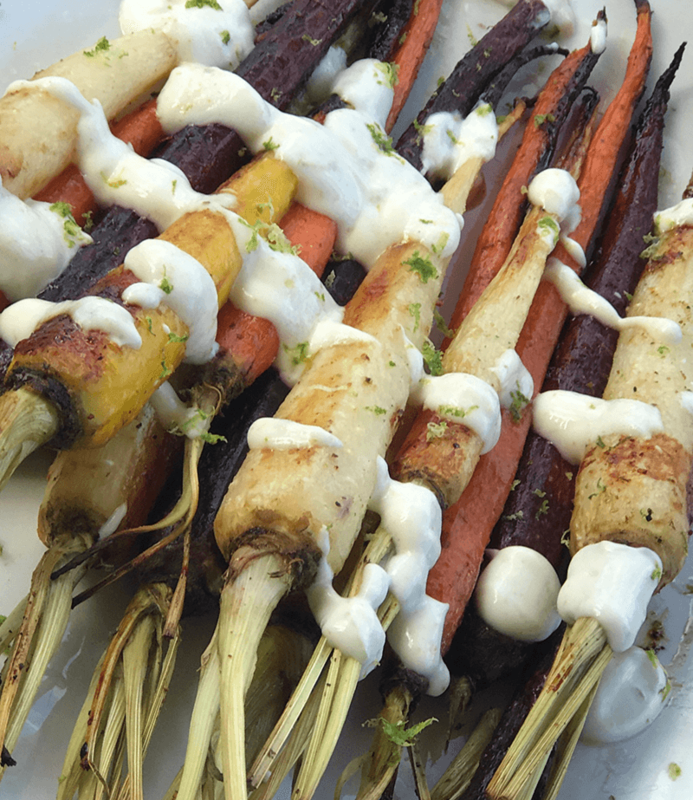 Once carrots are done, transfer to a platter, season with salt and pepper (if desired) and drizzle with yogurt sauce. Serve immediately. My daughter-in-law loves carrots. This will be new Dish for her. Sounds delicious! I’m so glad! I hope she enjoys it. I’m a huge fan of roasted carrots! Love this recipe, simple, different, and very flavorful! Thank you, Milla! I hope you enjoy it!